As many of you already know that the Rockies traded their starting pitcher Ubaldo Jimenez. Yesterday before the trade deadline. He was traded after starting the game in San Diego. After he pitched the first Rockies Manager Jim Tracy informed Ubaldo he was traded to the Indians. I heard the news while listening to the game on te radio heading back from Cheyenne, Wyoming. It was kinda of a damper on what had been a really good day. 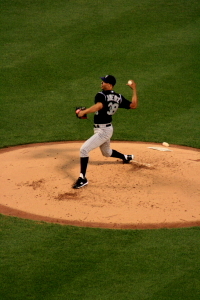 Ubaldo who last year was the first Rockies Pitcher to pitch a No Hitter for the Rockies he also holds the single season wins record for the Rockies with 19. Lowest ERA for a starting pitcher 2.88. Single season strike outs 214. and the Top three season lowest opponents Batting average. Lowest being .209 all this was done last year in 2010. This year he did falter but we always rooted for a great start that we knew he was Capable of. this year with the Rockies he went 6-9 with a 4.46 ERA. We just did not lose a pitcher who is capable of being a great. 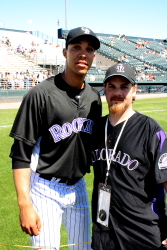 The Rockies traded away probably one of the nicest and humble baseball players that I have ever met he was always great to the fans. 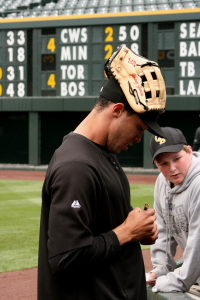 Signing autographs, tossing balls to the crowd during BP, talking and taking photos with the fans. I have put together some photos of Ubaldo from the past 2 years or so. Signing autographs for fans. He always took the time for the fans. and then all the way back to the dugout. I few times in the rain. 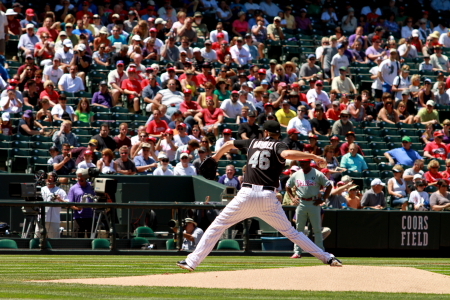 Here he is pitching in a random game against the Diamondbacks last year. 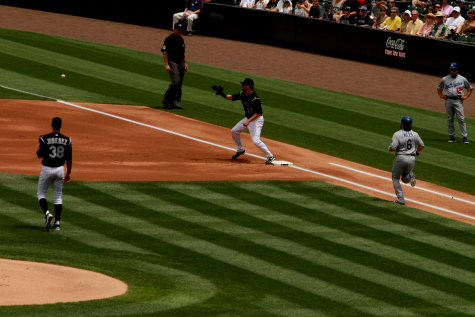 Against the Red Sox in June 2010. Not one of his best games but he pitched well and the Ump’s messed it up. The Rockies did win the game 8-6 but Corpas got the win. I believe This was the night Seth Smith hit a walk off to win the game. Heading to the dugout for a start in NY. Going for his 18th win of the season at Citifield. 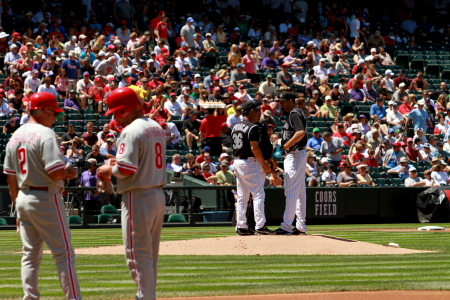 This was one of the best pitching games I have ever seen the Rox lost 1-0 and only 8 hits were let up for both teams. The one run by the Mets I think was a solo HR. 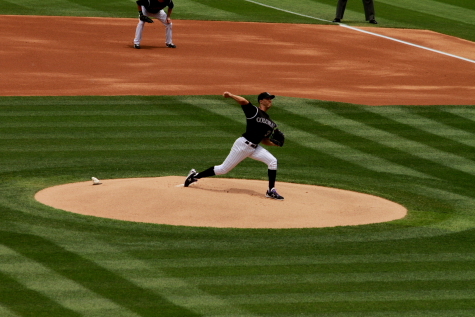 The Rockies won it was Matt Reynolds first career win. and left the illusive 19 win for U for another day. Well wish him all the luck in Cleveland and we will miss him. If we are lucky this will be a better trade then the Holiday one whiched turned out real well. The Rockies are returning home this week I will be at a few till then see you at Coors. Can U Win @ Home? 3rd game I was at in the series. I went to Matt Daley’s line 1st Because I had a card for him, I was the first one in his line. After i got his auto I headed over to Jhoulys Chacin’s line. Dex was still not signing by the end of the autograph session so I then got on line for Eric Young Jr’s line but he finished before I could get down for the auto, which is ok because I could actually just stand at the bottom of the line and hand out his autos from my own collection. I think I have 10 to 15 of his autograph. 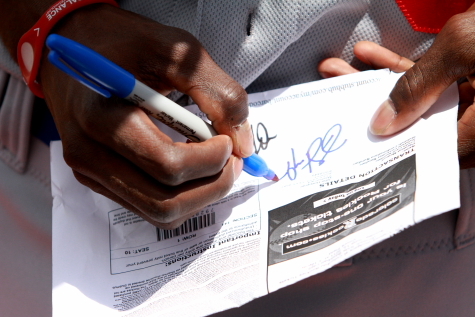 He has been a very generous signer here at Coors and in the Springs. 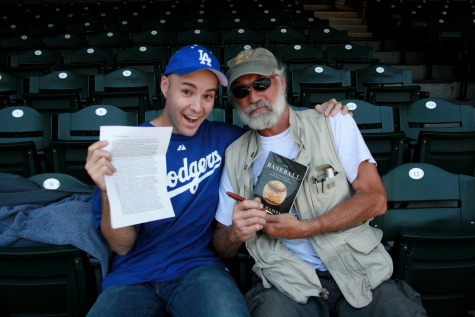 After The autograph session I headed to the Dodgers side of the field to see who I could get over their. 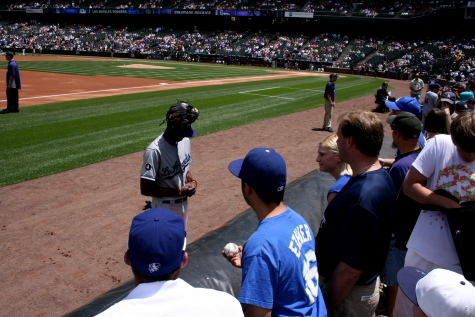 During warm ups I got Dee Gordon and Aaron Miles. 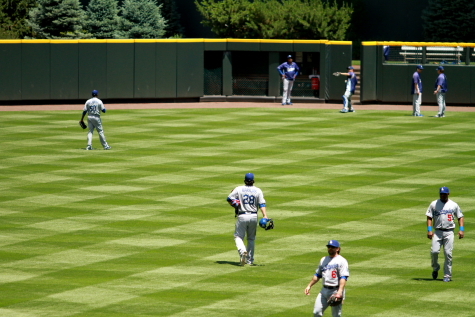 This is a photo of The Dodgers during warm ups. Dodgers Starter Rubby De La Rosa is throwing in the out field Aaron Miles and Juan Uribe are in the bottom left . 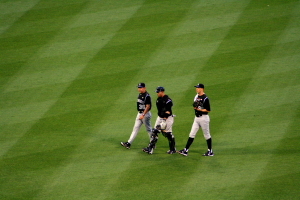 The Dodgers catcher Rod Barajas is in the middle heading out to the bullpen. To former Rockies Jamie Carrol and Aaron Miles getting some throws in before the game. This photo is of Jamie Carroll tieing his shoe that was taken by Zach Hample with my Camera. Zach and Robert Robert is holding a copy of Zachs book Zach is holding Robert letter that I have named the Manifesto!!! Robert has written a letter with a list of things that has happened to him at Coors Field and other Rockies Venues over the past few months. 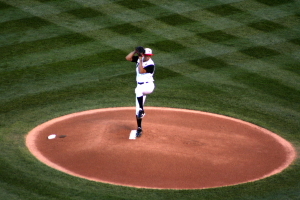 Ubaldo Jimenez Heading to the bullpen for his warm ups before his start. 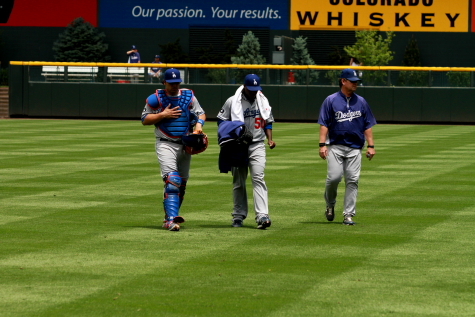 Rod Barajas, Rubby De La Rosa and Dodgers pitching coach Rick Honeycut heading in for the game. Ubaldo Jimenez throwing to the Dodgers lead of batter and former Rockie Jamie Carroll. Jamie abused the Rockies pitching staff in this game besides grounding out in the first inning he went 3 for 4 and walked in the game. 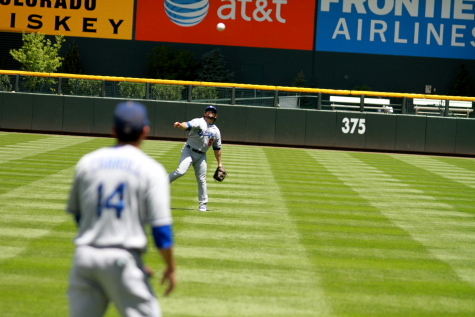 He was the first out of the game Aaro Miles would also ground out, followed by Andre Ethier flew out to left. 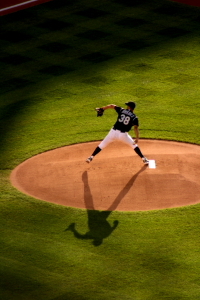 Ubaldo pitched very well in the 1st inning. Retiring the dodgers in order. Aaron Miles grounding out in the 1st inning. 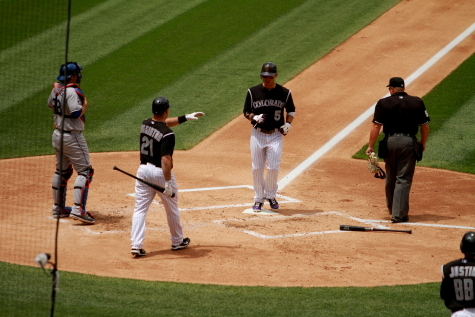 The rockies started the 1st inning very aggresive Carlos Gonzalez lead off with a double. He has been batting great since moving to the lead off spot looks just like the Cargo of last season. He went 3 for 5 this game with a double, single and HR, just missing the triple for the cycle. Just hitting a little better!!!!! After Cargo’s double Herrera and Helton would both get out The Deuce ( Troy Tulowitzki) would be walked and seth Smith got up and hit a 3 run HR to left that bounced of the second deck. 3-0 Rockies Jonny Herrera attempting a bunt in the 1st inning. 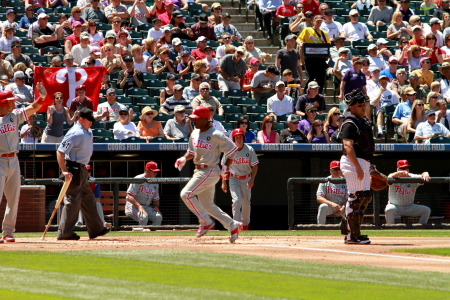 To the Left Carlos Gonzalez scoring the first run of the game after Seth Smiths 1st inning HR. 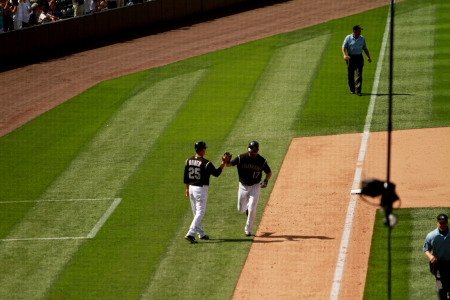 To the right Seth Smith High fives Cargo after his run around the bases. In the second the Dodgers tried to start their comeback very unsuccessful in the 2nd. Matt Kemp would lead of the inning with an out then James Loney would hit a single aswell as Juan Uribe. Rod Barajas the hit a ball to Herrera at second for the force on Uribe at second. 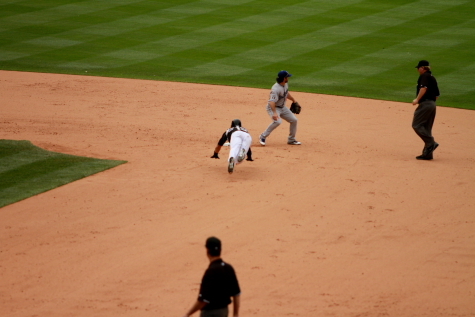 Barajas would the be safe on first. The Dodgers would not score in the inning and Ubaldo would end the Inning striking out Trent Oeltjen. The Rockie would not be very productive in the second and then the Dodgers would unleash on Ubaldo in the 3rd Jamie Carroll lead of with a single, Aaron Miles would then also single, Andre Ethier would be struck out. Matt Kemp was then walked to get to James Loney who hit a very high HR just above the auxilary scoreboard in right field. scoreing 4 for the Dodgers 4-3 LA. The dodgers would also get another run in this inning 5-3 LA. Niether team would score til the 5th inning at those were scored by the Dodgers Kemp Lead off the inning with a HR 6-0 LA. Rod BArajas then hit a solo HR 3 batters later 7-3 LA. Ubaldo was taken out in the 6th. He still wouldn’t get his elusive first home win of the year @ Coors. 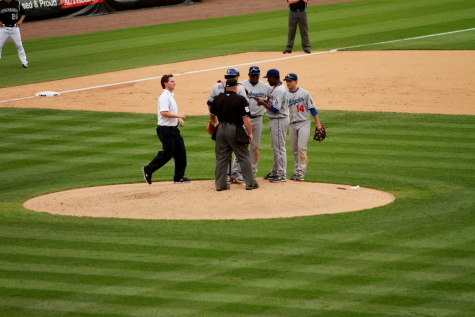 Rubby De La Rosa was then taken out of the game after throwing 1 pitch in the 6th with a cramp in his throwing arm. The Rockies would set up for a comback of their own in the 7th Jose Morales lead off the inning with a ground rule double. 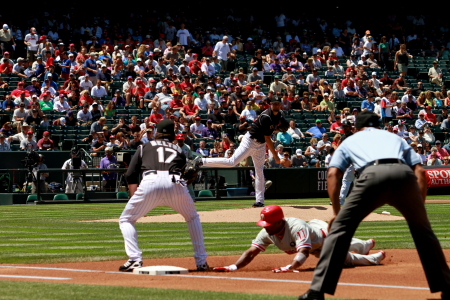 Then Cargo would hit a HR scoring himself and Morales. 9-5 LA , I forgot to mention the Dodgers scored to in the top of the 7th. Back to the Rockies 7th!!! Pinch hitter Ryan Spilbourghs then hit a double and was then advanced to third on a wild pitch or passed ball. He then scored on a HR by The Deuce 9-7 LA. 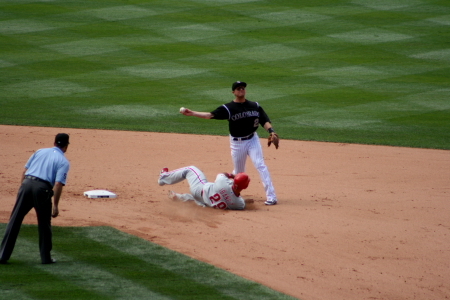 Spilli dives into second in the 7th. 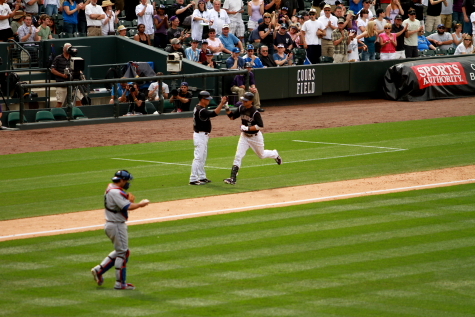 Cargo high fives third base coach Rich Dauer after his HR in the 7th. 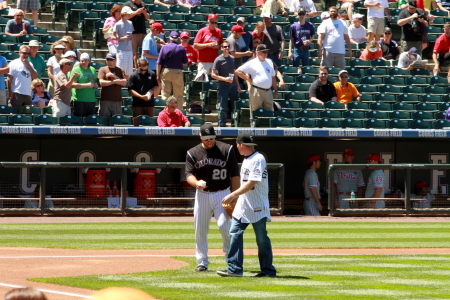 The Rockies would not go down with out a little fight after cargo and Spilli both got out to start the 9th Todd Helton would hit a solo HR 10-8 The Deuce woukd then hit a single. The game would end on a Smith hit to James Loney at first. The game would end 10-8 LA they would split the 4 game series with 2 games a piece. The Rox bats have picked up in the last week or so they just need to get the pitching rolling again. They are now 5.5 out of first place in the west and only one ahead of the Dodgers in 3rd. Brad Hawpe and The San Diego Padres would come into town for 3 here at Coors. My east coast road trip begins next week I will be in NY for 2 games against the Yankees missing one for a friends wedding. Then I will be heading south to NC for a week of minor league baseball around NC. Finishing up when the Rockies return to the east coast against the Nationals. Maybe I will see you There!!!!!! One Day To Go!! The Rockies Work Out for Charity. With 12 teams starting today here in the 5280 we still have a day to wait. 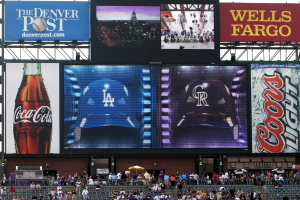 The Colorado Rockies held a workout for charity. It is a practice session that they do a short autograph signing and then a complete before game work out. So my day started by parking up on the north side of Lodo and taking my walk to Coors Field. As I was walking you can see the anticipation on the street for opening day. The Blake Street Tavern had their sign ready for their Opening Day Party and had the Flags of the Rockies and Root Sports hanging out front. So I followed the purple stripe down Blake St. Which leads you right to Coors Field, not that I needed direction. A look north up Blake St @ 21st. When I arrived Gary X was waiting in front of the home plate gates to be the first inside. A look of the growing crowd about and hour after I got their. With Doug from openstance.com in the foreground, his site is cool and has a lot about Major League Baseball and Stadiums past and present. When I got in I got on-line for autos and the players were not out yet the stadium had the Opening Day graphics going.The Arizona Diamondbacks were taking BP. They will be playing the Rockies tomorrow. The Diamondback in the batting cage. 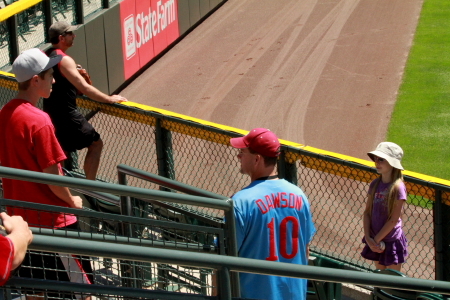 Todd Helton Heading to his section to sign autographs. The line i was in had jorge De LaRosa and Matt Belise signing I had each of them sign a baseball card. After they signed autographs they started stretching and the workout. Jhoulys Chacin and I believe Felipe Paulino on the warning track. 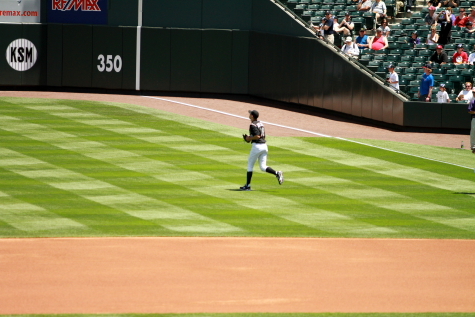 Ubaldo Jimenez throwing in the outfield. Matt Belise getting in some throws. 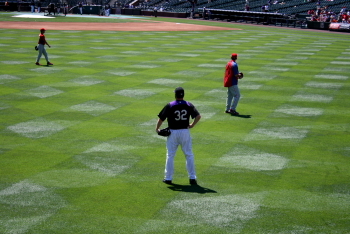 Then I headed to the outfield for the Rockies Batting Practice. 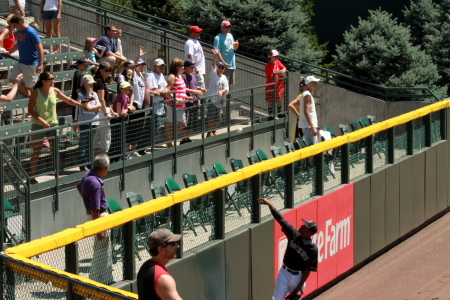 Matt Belise throwing a ball into the crowd. The Rantics from left to right Dan, Gary X, Joy & Jim sitting and “D” the Rockpile Ranter. 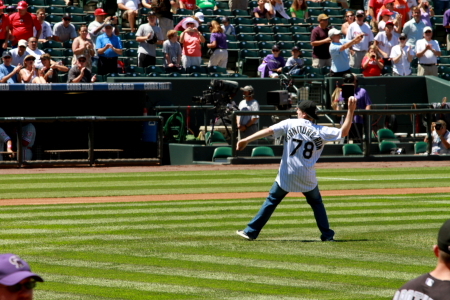 It was a fun day at Coors and was great to be back with the whole crew. 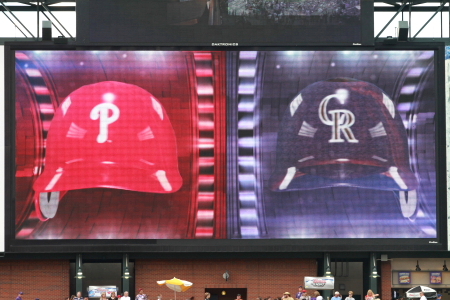 Can’t wait til tomorrow Opening Day at Coors Field. Go Rockies!!! Hope to see you there.